Mad love and belly laughs to one of our long running favorites, Barrel of Monkeys' THAT’S WEIRD, GRANDMA. They've been a Chicago Monday night staple since 1997, with ever changing stories penned by Chicago school kids and brought to life on stage in gut busting glory by professional actors. The 8pm Monday time slot is for other actors, most of whom have an off night after working all weekend. The best thing about BOM's summer run is, you can bring the kids! Barrel of Monkeys proudly presents THAT’S WEIRD, GRANDMA: Brand New Stories, a line-up of all new stories written by Chicago elementary school students during the 2017-18 school year. Be among the first to experience the newest songs, sketches and dance pieces adapted from stories written by students in Barrel of Monkeys’ creative writing workshops. 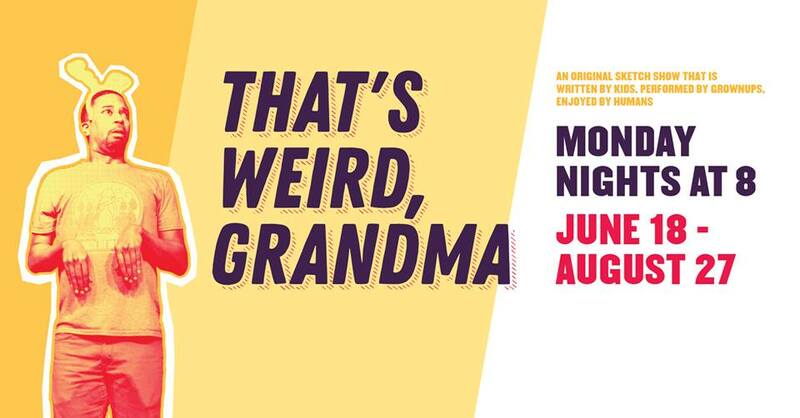 Directed by Artistic Director Brandon Cloyd, THAT’S WEIRD, GRANDMA: Brand New Stories will play Mondays at 8 pm from June 18 – July 16, 2018 at the Neo-Futurist Theater, 5153 N. Ashland Ave. in Chicago. Tickets are available at www.barrelofmonkeys.org or by calling (773) 506-7140. Clever and funny – touching and poignant – the collection of stories featured in THAT’S WEIRD, GRANDMA is equally entertaining for adults and children. The line-up of the long-running, critically-acclaimed revue changes each week by audience vote, so no two shows are ever the same. Tickets: $15 for adults; $5 for children 12 and under. Discounts: $10 for students with ID, seniors, veterans and groups of 10 or more people. $5 for Teen Arts Pass (TAP) members. Tickets are available at www.barrelofmonkeys.org or by calling (773) 506-7140. Brandon Cloyd joined Barrel of Monkeys in 2007 and has been deeply involved in many facets of the company ever since. Prior to joining BOM, Brandon graduated from Northwestern University with a Bachelor of Arts in Theatre and a minor in Business Institutions. Within BOM, Brandon has served as an actor, teaching artist, lead teacher, a member of Teacher Corps, as well as a director for schools and public performances of That's Weird, Grandma. Before becoming the company’s Artistic Director in September 2017, Brandon served as BOM After-School Program Coordinator at Loyola Park from 2014-2016 and Program Director from 2016-2017. Outside of Barrel of Monkeys, he worked as the Associate Director of Camp Echo, where he has spent 13 summers managing campers and staff at a co-ed sleep away camp in Upstate New York. Brandon has worked with other theatre companies including Urban Theatre Company, American Theater Company, Filament Theatre, Ingen Productions, ACLE's Teatrino in Italy and Purple Crayon Players at Northwestern University.